Here are the details of Roman Numeral bingo. This particular bingo game is designed to help students practise Roman numeral numbers. Each student is given a bingo card or bingo worksheet containing a different random selection of Roman numerals (note: these do not necessarily need to be the standard bingo numbers expressed in Roman numeral form, but could be any numbers at all). The teacher (or parent) reads out numbers in a random order - the Roman numeral versions of which are printed on the students' bingo cards. The students then try to look for the number on their bingo card, or solve the problem and find the answer on their bingo card.. If they find it, they cross off that square (or cover it with a counter). Students start off with one square they can mark off without waiting for it to be called out - the "Free Space" square in the middle of the bingo card. 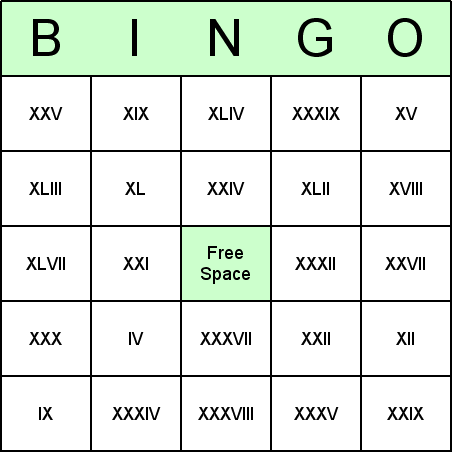 Here are some free printables for playing Roman Numeral bingo. They include a call sheet (for the teacher or parent to use for bingo calls), and a set of 8 bingo cards to give to students. Note: The sample call sheet included in the printables, contains the Roman numerals numbers. The teacher would of course announce the English number when making bingo calls. Try using different Roman numerals. The Roman Numeral bingo printables on this web site were produced using the registered version of the Bingo Card Printer software. You could easily make your own bingo games using the same method. Note: Instead of beginning from a blank template, if you wish to, you can start from a non-blank template, for example Roman Numerals 1 to 49 (on the Classics tab), and then use that as a starting point to which you can add additional items, or remove unwanted items. You can download the settings file bingo_roman_numerals.bcp by clicking here. Save the file to a folder of your choice on computer.